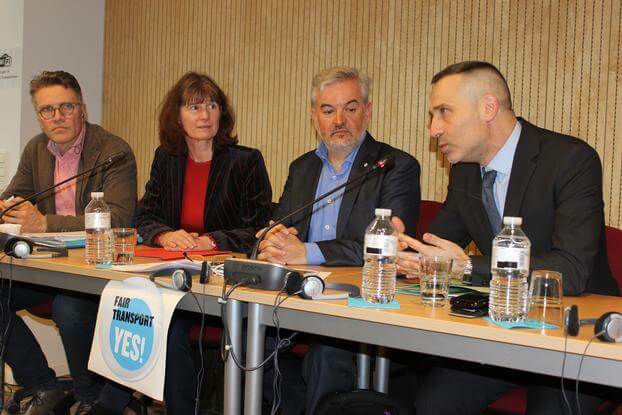 On Monday 14 March 2016 the European Transport Workers’ Federation (ETF) and the International Association of Public Transport (UITP) signed a joint statement to promote sustainable urban mobility in Europe and promote quality working conditions in the urban public transport sector. The development of urban public transport is essential to cope with the diverse challenges faced by expanding urban areas where the vast majority of Europeans lives. The public transport sector contributes to the attractiveness of cities by attracting talents (companies consider the quality of transport links as one of the most important factors for considering business locations in Europe), building skills and offering job opportunities. The quality of public transport service is a crucial aspect to attract and retain users. In this regard, employees are an important factor contributing to the success of public transport operations. The quality of the working environment as well as motivated, well trained and rewarded staff represent essential elements for delivering quality services to the customers, which are at the heart of the process. Work intensification, congestion (health), safety (accidents) and security (aggression on public transport) are elements jeopardizing the working environment and thus the attractiveness of the sector including for young workers or women. The ETF and the UITP call upon the European institutions to take as a priority the development of sustainable urban mobility and to support the modal shift towards cleaner, more efficient, safer, public mass transportation modes. Public transport should be an integral part of any urban development agenda and local authorities should be empowered to successfully carry out integrated urban strategies that cover public transportation but also housing, education, culture, tourism and employment policies. In this context, UITP and ETF strongly emphasise the responsibility of all levels of government, including the European level, to ensure quality in public transport and thus quality working conditions, the provision of appropriate financing as well as a close cooperation among employers, employees and trade unions to pursue and achieve common objectives. You can download the ETF-UITP joint statement in English, French and German.